Measures the Torque and Speed on rotating shaft thanks to the CENTOR TOUCH DUAL TRD. ANDILOG proposes a complete measuring solution based on a rotary drive torque sensor, equipped with an internal rotational encoder, and its advanced Centor Touch Dual gauge. 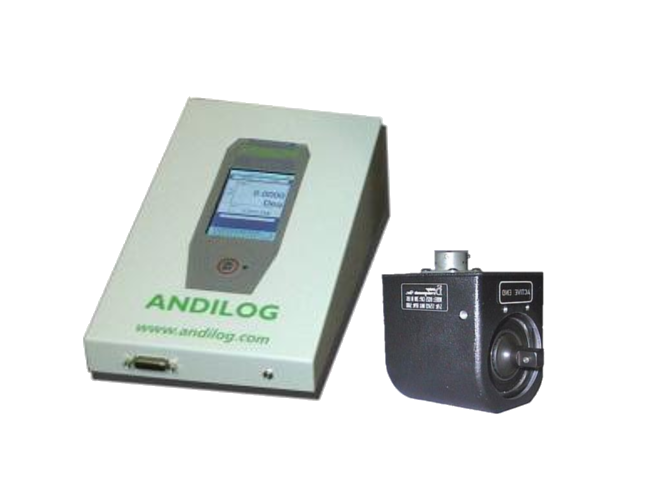 This unique model replies to many rotating processes that require torque and speed auditing, feedback control, monitoring and analysis. The rotary drive torque Centor Touch Dual has the ability to rotate and measure torque applied to rotating drives applications. Therefore it is the ideal solution for systems designed for continuous rotation. Now equipped with an internal encoder, it is the perfect model designed to measure: rotary torque, rotational displacement (angle or nb of turn) and speed. With its large touch screen and ability to read two channels simultaneously, the Centor Touch Dual displays both values: torque and rotation displacement, and for the most demanding engineers it graphs in real time the curve: torque versus rotational displacement. By offering test calculation capabilities, the Centor Touch Dual allows users the ability to measure the speed. The rotary torque Centor Touch dual gauge is a unique solutions for applications involving assessment on knobs, threaded fasteners tightening, performance verification. Build with a robust design, it can be integrated into various application environments and fields. The drive rotary torque gauge Centor Touch Dual model with build-in encoder is the perfect solution for all your low and medium drive applications. The rotary drive torque sensor includes an internal encoder, to measure the rotational displacement, and it's linked to the graphical Torque Gauge CENTOR TOUCH DUAL, which is able to collect measurements from two channels. The rotary torque sensor is mounted in line on the rotating shaft. The system DATASTICK allows you to save you data on a USB stick in one click, whether you are doing your measurement indoor or outdoor on the field, we propose you a complete mobile solution. All data, results and curve are saved on your USB stick, no more needs of a computer.